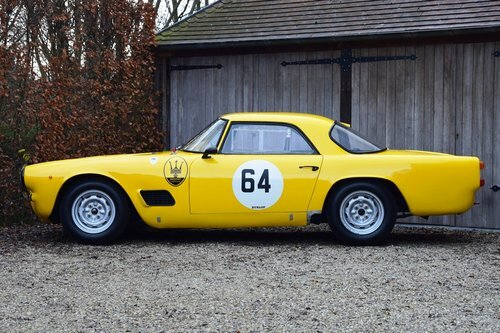 A Maserati 3500 GT is not your typical race car, despite the fact that this stylish GT designed and constructed by Carrozzeria Touring Superleggera had an engine derived from the famous Maserati 350S racers. 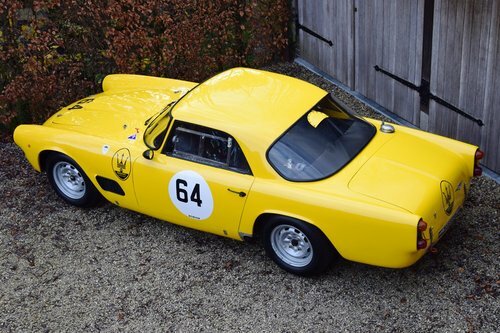 However one day an Italian gentleman decided to build a competition version based on this lovely grand tourer, and the result was quite stunning. And so in 1983 this unique Maserati was rebuilt for competition purposes, and only used for historic racing since. 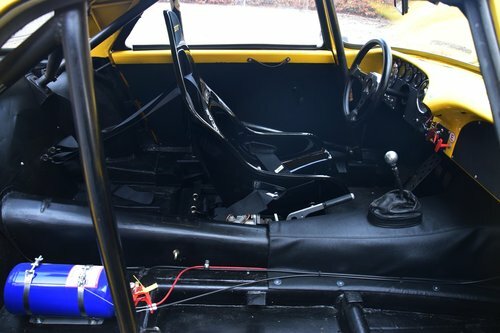 It looks incredibly cool in yellow with a very racy and stripped out interior. The car was raced in Italy from 1983 until 2000, and was then acquired by Bob Gilbert who had it rebuilt by Bill McGrath. The Maserati was then succesfully campaigned for many years in British historic racing, and maintained regardless of cost. 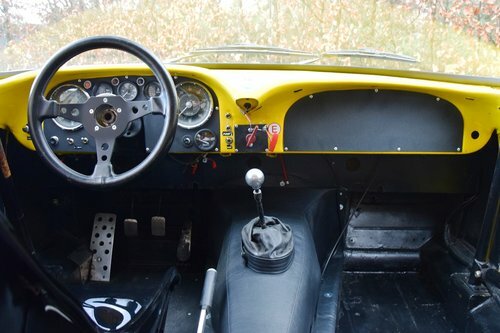 It had an older FIA HTP (Competition GT Car - Period E - 1947 to 1961 - FIA Class GTS7), and we have just upgraded fuel tank, harness and racing seat to 2018 specification to obtain the new FIA HTP valid until 2028. 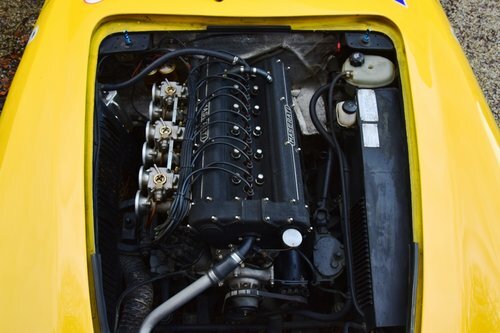 The car is well documented, and has a british V5 road registration so it can be turned into a road racer as well. It is probably eligible for Tour Auto and Peter Auto "The Greatest's Trophy", and a welcome sight at any historic racing event. It may be accepted for Goodwood Revival or Members Meeting as well, because it is such a rare and impressive beast on the starting grid. 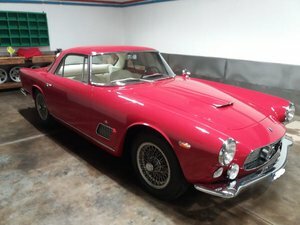 The chance that you meet another 3500 GT on the track is almost non-existing. 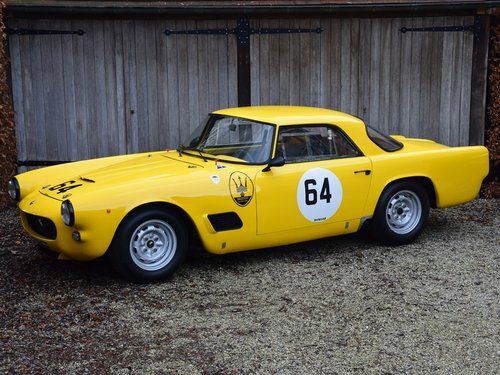 So if you are looking for a proper gentlemans race car, then this is the one to consider. 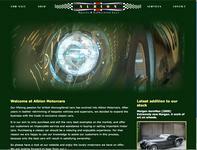 Very realistically priced, and a true thoroughbred which will offer lots of fun on the track.